WASHINGTON -- BAE Systems completed crucial shipboard testing of its new Amphibious Combat Vehicle prototype with partner Italian company Iveco Defense Vehicles in the Ionian Sea off the coast of Italy last week. John Swift, BAE System's ACV program manager, told Defense News at the Navy League's Sea-Air-Space conference at National Harbor in Maryland on Wednesday that the company and its partner Iveco demonstrated the vehicle's ability to perform consecutive ship launch and recoveries and operate the vehicle in six- to eight-foot surf and white caps in wind roughly 10 to 15 knots. BAE Systems and SAIC are building ACV prototypes for the Marine Corps in a competition. The Marine Corps awarded each company roughly $100 million in December 2015 to build 16 prototypes each for the service to test. 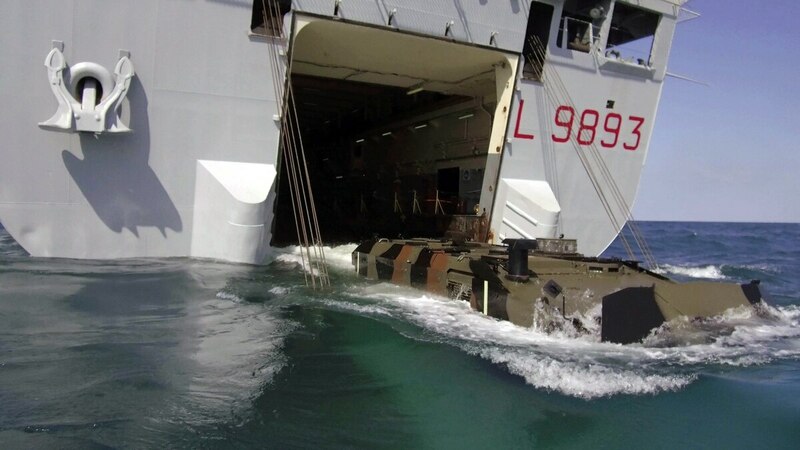 In the independent at-sea tests last week, Iveco's vehicle was able to demonstrate an objective capability the Marine Corps wants for its next ACV variant beyond the original version: the ability for the vehicle to drive itself back onto the boat up a ramp, Swift said. Because the vehicle's unique 8x8 wheeled configuration, it has traction that replicates a tracked vehicle and enough torque to pull itself back onto the ship. The capability also helps the vehicle transition in soft soil coming up onto a beach, he noted. And the vehicle also came ashore transitioning from surf to land, according to Swift. The testing in the Ionian Sea marks a capstone event at which the Italian Navy and Marine Corps were present to generate "a bit of energy" toward funding for Italy to start its own engineering and manufacturing development phase of an ACV program it started over five years ago. The Italians have yet to reach the engineering and manufacturing design phase with an Amphibious Assault Vehicle replacement for its amphibious battalions resident in the Navy, Army and Marine Corps due to funding shortfalls and worldwide commitments in support of NATO, where funding was diverted. BAE presented its first ACV prototype to the Marine Corps in December and has delivered six vehicles to date, Swift said. Two more will go to the Marines next week. There are currently four in tests with the service: two at Aberdeen Proving Ground, Maryland, one at Yuma Proving Ground, Arizona, and one at Camp Pendleton, California. BAE and SAIC are required to deliver 16 vehicles each to the Marines by June 15. A final request for proposals is expected in December with a response due in January 2018, Swift said, adding he expected a low-rate production decision in June 2018. The Marines plan to field 204 of the vehicles by 2020. The total value of the contract with all options exercised is expected to amount to about $1.2 billion. Some of the features BAE believes are particularly attractive for a new ACV is that it has space for 13 embarked Marines and a crew of three, which keeps the rifle squad together. The engine's strength is 690 horsepower over the old engine's 560 horsepower, and it runs extremely quietly. The vehicle has a V-shaped hull to protect against underbody blasts, and the seat structure is completely suspended. SAIC's vehicle, which is being built in Charleston, South Carolina, offers improved traction through a central tire-inflation system to automatically increase or decrease tire pressure. It also has a V-hull certified during tests at the Nevada Automotive Test Center — where all prototypes will be tested by the Marine Corps — and has blast-mitigating seats to protect occupants.